the ratio of the surface freezing or thawing index to the air freezing or thawing index. thin, elongated ice crystals that form perpendicular to the ground surface. the difference between accumulation and ablation; usually expressed in terms of volumes of water equivalent per unit area. difference between the downward and upward terrestrial radiation fluxes; net flux of terrestrial radiation. (1) young, granular snow that has been partially melted, refrozen and compacted; névé that survives a full season is called firn; firn becomes glacial ice; (2) also refers to the accumulation zone of a glacier. a general category of ice that consists of frazil, grease ice, slush, and shuga. a recent snow deposit in which the original form of the ice crystals can be recognized. very small glacier that occupies gullies and hollows on north-facing slopes (northern hemisphere); may develop into cirque glacier if conditions are favorable. 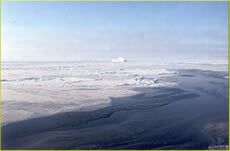 a thin sheet of smooth, level ice less than 10 centimeters (4 inches) thick; appear darkest when thin. a principal cloud type (cloud genus); gray and often dark; rendered diffuse by more or less continuously falling rain, snow, sleet, etc. of the ordinary varieties and not accompanied by lightning, thunder, or hail; precipitation in most cases reaches the ground; may or may not merge with low, ragged clouds that frequently occur below. ice is said to nip when it forcibly presses against a ship which is beset; a vessel so caught, though undamaged, is said to have been nipped. soil or rock at temperatures above 0 degrees Celsius. a patterned ground form that is equidimensional in several directions, with a dominantly circular outline which lacks a border of stones. a patterned ground with cells that are equidimensional in several directions, neither dominantly circular nor polygonal, and lacking borders of stones. a patterned ground form that is equidimensional in several directions, with a dominantly polygonal outline which lacks a border of stones. a patterned ground feature with a step-like form and a downslope border of vegetation embanking an area of relatively bare ground upslope. form patterned ground with a striped and nonsorted appearance, due to parallel strips of vegetation-covered ground and intervening strips of relatively bare ground, oriented down the steepest available slope. the relatively weak general area of high pressure which, as shown on mean charts of sea-level pressure, covers most of North America during winter; this pressure system is not nearly as well-defined as the analogous Siberian high. an oscillation in the strength of the Icelandic Low and Azores High, the two dominant surface pressure features in the North Atlantic. When both are unusually strong, the North Atlantic Oscillation (NAO) is in its positive phase; when both are unusually weak, it is in its negative phase. The NAO has climate impacts not just in the Arctic, but in North America and Europe. The NAO, identified by Sir Gilbert Walker in the 1920s, is similar to the Arctic Oscillation. 90° N latitude; one of the two points where the Earth's axis of rotation meets the Earth's surface (the other being the south pole, diametrically opposite). a rocky crag or small mountain projecting from and surrounded by a glacier or ice sheet.